Sarasota Jets Fans you have a new place to call home. Evie’s Tavern and Grill University in Sarasota – Formerly Crazy Ted’s on the corner of Whitfield and University. It is one of 4 successful Evie’s restaurants/bars to open in the area and is located off University Parkway exit (213?) West about 2 miles to Whitfield Ave. make right into small shopping center. It’s on the Sarasota County / Manatee County dividing line. So, fans from both communities are more than welcome to attend. Not only can you get information about the all new Sarasota Jets Fan Club but you can also LIKE us on Facebook. Just click the Facebook logo to the right to get to it. Be sure to head over and like the page as soon as you can so we can get our official Facebook name. See you soon. 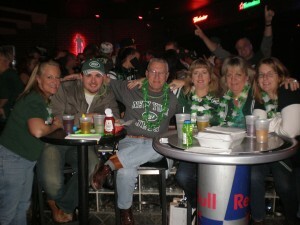 After spending the last few years watching our Jets in various places or heading to Tampa to catch a game with our Sister Club in Tampa, we finally have a place to call our own. 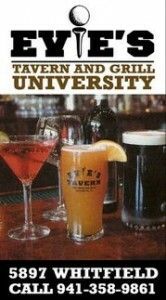 The name of the place is Evie’s Tavern and Grill University Restaurant Sarasota. Formerly Crazy Ted’s on the corner of Whitfield and University, it is one of 4 successful Evie’s restaurants/bars to open in the area. It’s located off University Parkway exit (213?) West about 2 miles to Whitfield Ave. make right into small shopping center. Since it’s right on the Sarasota County / Manatee County dividing line, fans from both communities are more than welcome to attend. We’re looking forward to growing the club here in Sarasota with occasional trips up to Tampa to hang with our friends to the north.